When shopping for a holster, it's vital that it be well designed, well made, durable, comfortable, easy to use and reasonably priced. We at High Noon Holsters understand the needs of handgun owners, and we custom make every holster to your specifications right here in the USA. 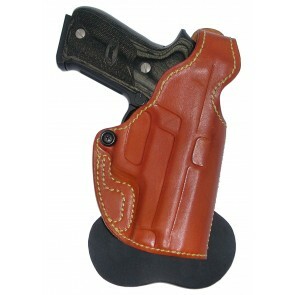 Handcrafted using the highest quality leather, Kydex and polymer, our superior holsters are built to last. From belt holsters to IWB holsters to paddle holsters, we pay attention to every detail to ensure we deliver a premiere product that meets the highest expectations. Flexible and made to order, our holsters come with a 100% satisfaction guarantee and are IDPA approved, which means they meet the standards set by the International Defensive Pistol Association. At High Noon Holsters, our paddle holsters pair exceptional style and classic luxury with speed and convenience. Designed with the flexibility of options, our holsters never lose their tactical edge. Crafted for concealment, our paddle holsters have no protruding bulge, are made from full grain leather and come in two luxurious designs, the Speedy Spanky and the Spanky. 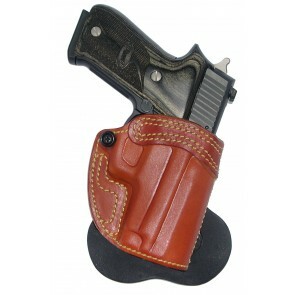 At High Noon Holsters, we pride ourselves in providing excellent customer service and the highest quality products. We welcome new visitors and are so glad to serve our many returning customers. When ordering if you don't see your gun model in the dropdown menu, please call us at (727) 939-2701. We offer Free Rush Service and Free Shipping on all orders over $300, and for your convenience, we take credit cards or PayPal. With pleasure, we look forward to serving you.